Once we’d picked up our tickets for the nearly-sold-out Impressionism show at the de Young museum, we wanted to explore the Golden Gate Park’s pretty stunning grounds. The architecturally-brilliant museum sits among perfectly tended greenery and fountains, across from another ultra-modern building, the Academy of Sciences, whose roof resembles a recently landed UFO ship. 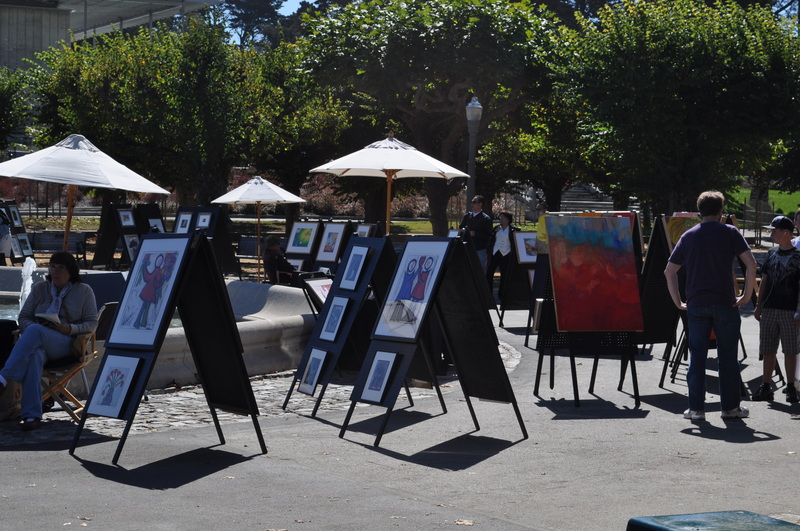 Between the two museums, we found an en plein air show of San Francisco Artists. The most interesting of the bunch was Michelle MacKenzie’s – an artist who “sculpts” this hills and mountains on the canvas prior to painting them, creating a deep, textured setting for her bright images. The sunset landscapes popped with deep reds and oranges that you knew would make you at once content and excited even if you saw them in your entryway every single day. I was more up for simply taking in the view than contemplating MacKenzie’s theory of the trees representing how we’re all intertwined as human beings (true, but there are times when it’s better to appreciate the artistic value rather than stretch – questionably – a painting’s meaning with philosophy). In preparation for the Impressionism show, we also spent a bit of time with Allan Friedlander’s landscapes – probably inspired by Wine Country but with a universal feel – many of them quite beautiful. You can see more of his portfolio here. It seemed obvious at first: when in San Francisco for a weekend trip, visit the Museum of Modern Art. It’s probably the city’s best known museum. I’d been there once before, fourteen years ago, and still perfectly recollect the modern, sweeping white architecture of the place. But when I read that a museum called de Young was playing host to the works of Van Gogh, Gauguin, Cezanne and their contemporaries – a collection of Impressionism and Modernism one can only typically find at the d’Orsay in Paris, I shifted the itinerary and headed west. I wasn’t the only one, of course. The line to get in was impressive, and got even more so when we got downstairs after the initial entry in the spacious, extraordinarily welcoming atrium. The de Young was conceived to be supremely accessible, and I suppose it was, but that’s not the first word that comes to mind. It is grand and an artwork in its own right for its remarkably minimalist yet warm interior. We got in to the 1:30 showing at 2:15. But the show – and the way it was curated and hung and presented – made it worth the wait. It even made the cramped line-up to the entrance, which in my experience matched only the Dali show at the Tate Modern in England, worth it. There were Degas’ ballerinas. 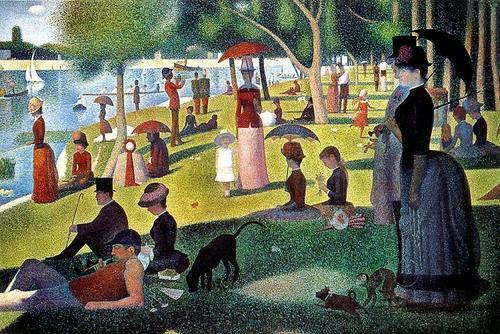 And tiny studies Seurat painted to prepare for his pointillist masterpiece – zoomed-in images that let you experience the painting in a more focused way. But to my surprise, the work that made the most vivid imprint weren’t the celebrated Van Goghs or Cezannes or Gauguins, but a small canvas by Post-Impressionist artist Emile Bernard titled “The Harvest.” (The thumbnail can’t do the composition justice but here it is anyway). 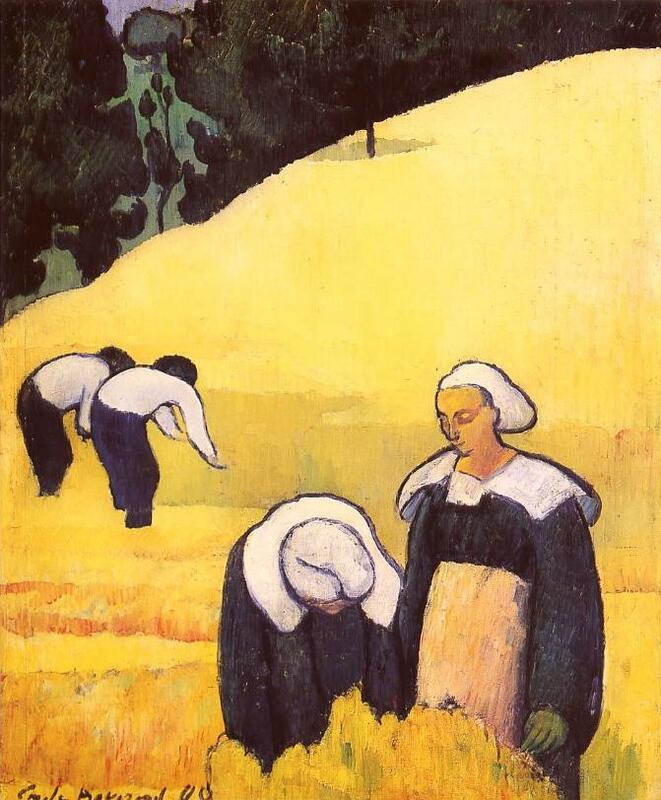 Emile Bernard, “The Harvest,” 1888. The work is an example of the Nabis movement. The artists’ idea was to reduce their subject to the fewest shapes and colors possible, creating a flat, abstract image. Sounds a bit over-simplified, perhaps, but the result is anything but. The Nabis artists sought to get away from the impressionists’ realism (if you can think of Impressionism as a “realist’s” artistic realm, which can be difficult, but the idea is that through their brushstrokes, Monet and his contemporaries sought to recreate and magnify the light and depth of the real world). But in their move toward abstraction, they created colorful, patchy, stained-glass-like scapes that are simple yet filled with life and feeling – perhaps due to the way painters like Bernard used color and positioned their subjects. My husband joked that I liked the landscape because it reminded me of my childhood in Russia. I didn’t grow up on a farm, but it’s true that Bernard’s interpretation of anonymous bodies working in the lush field in the forest does evoke a landscape I saw many times as my mother walked me through Russian museums. But the theme is universal, really, and by stripping it down to its essence, Bernard tapped into a scenario that’s taken place in countless places across time and space. And when you see the originals up close, it’s clear why: there’s their timeless appeal on the one hand and ability to transform at every viewing on the other. The context makes all the difference, and I suppose that’s why art should be seen in a museum – and preferably not in the same one. 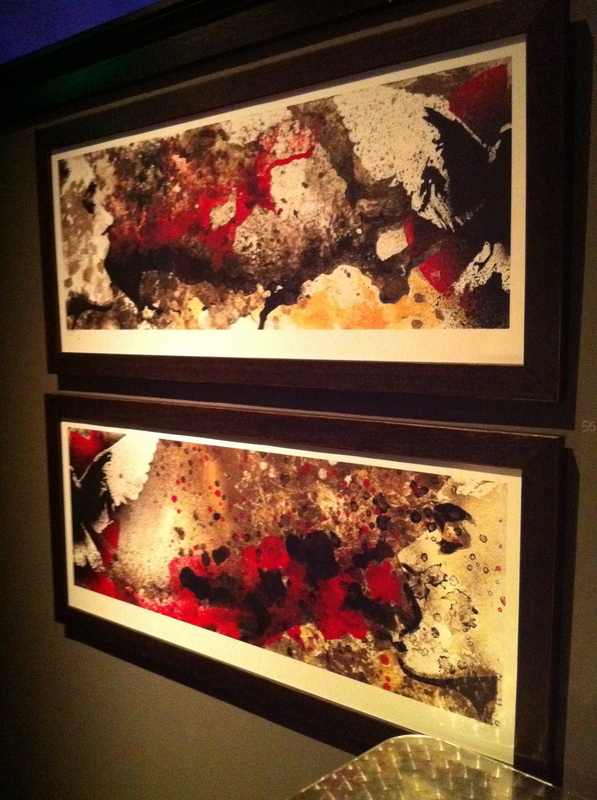 The dark walls that serve as the backdrop and the dim lighting create an intense intimacy in this particular exhibit. And there’s another reason: at every visit, you’re reminded of fascinating tidbits from the artists’ lives. 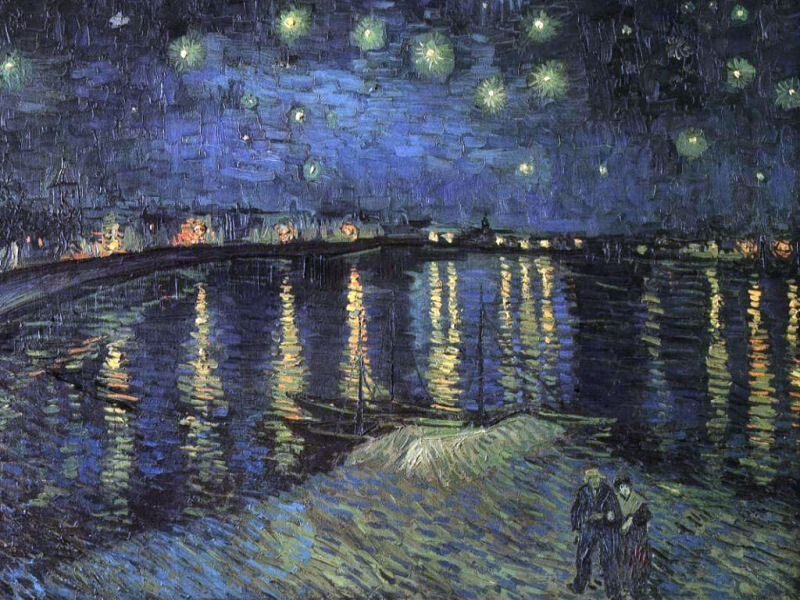 Like the fact that Van Gogh’s career lasted a mere ten years. 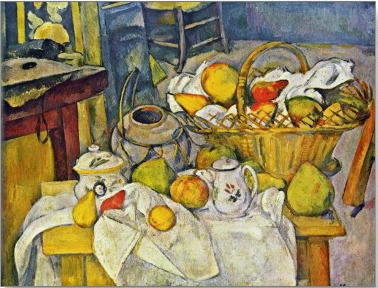 And then there is the curator’s ability to make you see the works in a new light, like when you hear (I rented the guided tour this time) that Cezanne’s fruit can keep you staring for longer than just about anyone else’s simply because he positioned the items on a table in an impossible way. Things should fall, but they don’t. We sense this on some level, but not consciously, and the disturbance is endlessly fascinating to our minds. So when we wonder, “Why, really, is this work so much more famous that the fruit bowl my grandmother drew?,” we have our answer. The show finished with decorative art: huge canvases of flowery brushstrokes. They couldn’t quite compete with the ones that had preceded them, but it was the concept behind the decorative art that stuck. The decorative painters wanted to do away with the art world’s hierarchy. Art, they thought, didn’t have to be a lofty pleasure reserved for society’s crème de la crème. It could simply take up where architecture left off, becoming quite simply a design addition with no grand message. I’d imagine that many artists must have been liberated by this notion, which made it OK to paint simply to complement a living room (and let’s face it, many of the world’s most celebrated pieces came about precisely because a wealthy patron commissioned them, for one reason or another, to grace his or her living room). “Van Gogh, Gauguin, Cezanne and Beyond: Post-Impressionist Masterpieces from the Musee d’Orsay” runs at the de Young Museum through January 18, 2011. De Young is the only museum in North America to host the exhibition. On Sunday night, we headed to 111 Minna – a venue our SF Lonely Planet guide described as a lounge with an art spin. There’d be an art show topped off with a runway hair show – and who wouldn’t want to witness that over cocktails? We got our wrists stamped by a black-clad, tattooed, plentifully pierced 20-something, and that sort of set the scene for the rest of the crowd. Alternative, totally at ease, ready to gyrate to the disco beats coming from the DJ even if they were the only ones on the dance floor. One wall of the loft-feeling space was lined with canvases, the other with the bar. So first, the art. 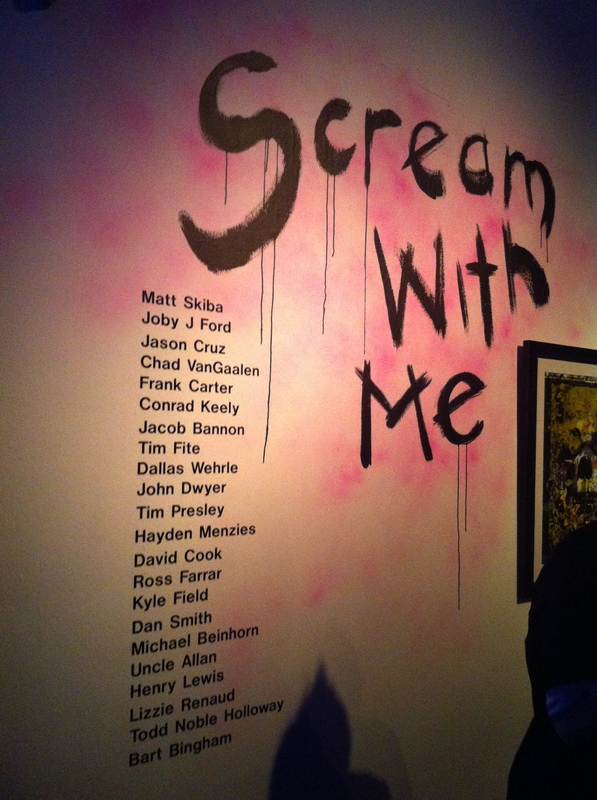 The show, called “Scream with Me,” is nothing if not edgy, modern and a tad rebellious. 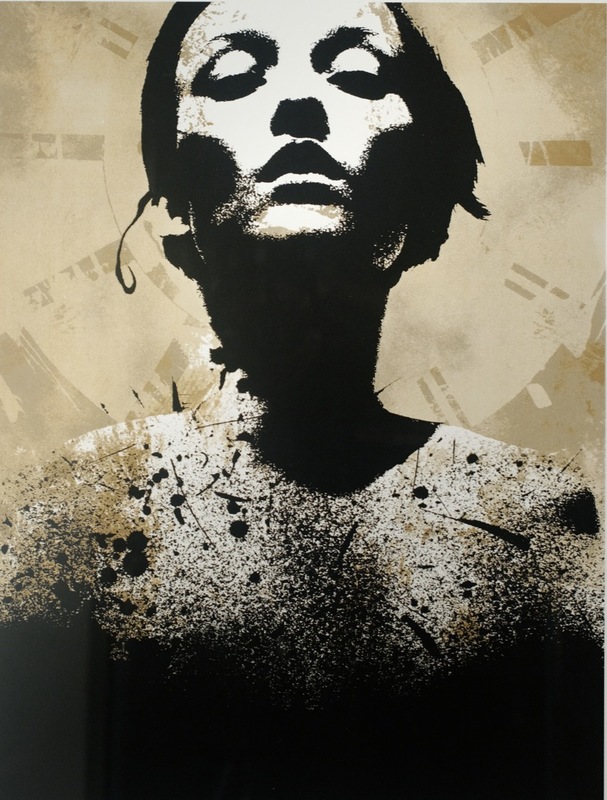 The curator chose pieces by musicians and some of the world’s top tattoo artists. That explained why everyone was sporting a collection of tattoos – but I had no idea that tattoo artists ventured from skin to the canvas and could produce quite cool works that honestly hardly resembled body art. Interesting.